The Society for Creative Anachronism was started in the idealistic 60's, and has survived this long as a medieval and Renaissance arts-and-research co-op. Tournaments and wars make the most photographable and noisiest impact, but there are many other things to do and learn and be and see. People teach each other (or just learn from being around it all) music, brewing, calligraphy, armoring, cooking, costuming, needlework, heraldry, equestrian arts, archery, games and courtesy. People take names, and places have names, within the game. 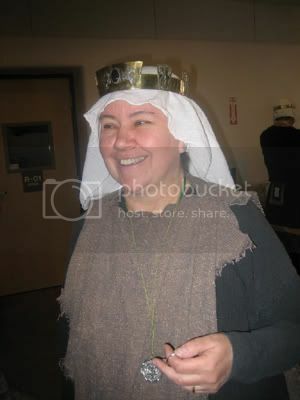 So "mundanely" I am Sandra Dodd from Albuquerque, New Mexico, but within the SCA I am Ælflæd (ELF-led) of Duckford, of al-Barran, in the Outlands. I have been involved for nearly thirty years. I am a countess, a viscountess, a Mistress of the Pelican, a Mistress of the Laurel and a Walker of the Way. (I have some other cool honors too, for arts and service.) 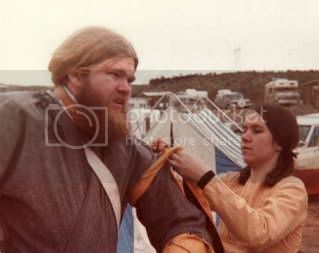 Master Gunwaldt Gulbjorn is my husband and long-time partner in SCA singing, camping, feasting and philosophizing. ��I have helped him with some very fine squires, five of whom were knighted (one is a Master of Arms). ��I myself have and have had students of whom I am wholly and (perhaps, but I think not) inordinately proud. I think a lot of my biography will be about the people who affected me, who introduced me to ideas and to their own interests and fascinations. Simonetta, Baldwin, Mark Lasie and Gunwaldt. Dave and Fran McPherson, who had taken me to Outlandish III, and who were at the May Games which I consider to be my real first event. Elinor Aurora who was my "speed scroll" partner for a while and my very-long-time singing partner. After most of those were doing other things, Artan macAilin and I shared interests and projects lots of times. There have been others I was close to and am still in contact with, and all have made my life better—SCA and "real" life. What's below is a summary, being added to occasionally. Here is a reconstructed chronological collection of where I was and what I was doing: Chronicles, also in progress. That same year I was going to go and play recorder at a wedding of John and Cassandra (I knew them through folksinging), but misunderstood the meeting time and missed it. That came to be considered the first al-Barranian event. I became more organized and efficient as I got older. In 1976 I went to Grand Outlandish III with the McPhersons for most of the day Saturday. I didn't join. The next Spring, I attended Lonely Mountain May Games, at which I first met Elinor Aurora of Rosewood. (We still sing together at Christmas, though she left the SCA years ago and now writes historical novels about the Civil War in New Mexico P. Nagle) Fran McPherson had brought a turkey stuffed with whole grapes and some other stuff. I played recorder. There was a maypole, or at least there were ribbons. Wilhelm of the Bogs was the tallest one there, so he held the ribbons up as high as he could and they danced around him. I joined when I got home. 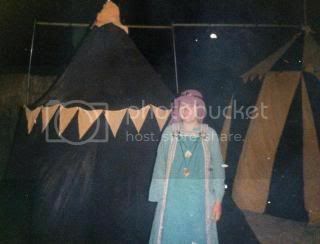 Later that same May, 1977, and eight of us from Española went to Outlandish IV, as a household named Duckford. I remember thinking that afternoon, during the tournament, that I hoped someday I would have my name in the kingdom newsletter, and I hoped that someday a king would know my name. That seemed to me to be plenty to envision. A year later, I autocratted Outlandish V, and was seneschal of the Principality of the Outlands. 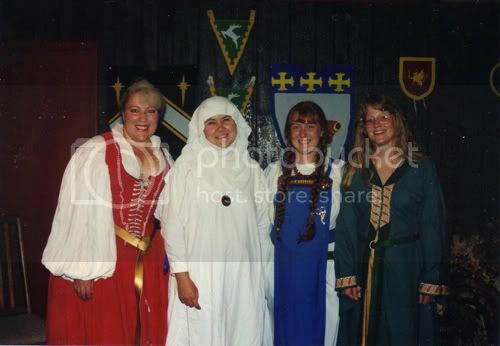 Life moved quickly, I got to do lots of SCA travel (mostly with Gunwaldt), visiting lots of places I never would have gone otherwise. I learned calligraphy, newsletter production, all about non-profit corporations (at least all about one small one based in California). I helped others learn to sing (or at least gave them opportunities to learn new songs and perform in public), and to write (or to write more thoughtfully, maybe) and to organize things. I was once seneschal of Atenveldt, and here's my OP listing in that kingdom. Cool! Nice duck. (Not rampant, but still... My augmentation of arms is a very, very Atenveldt thing, and I still remember clearly receiving that, and the conversation with King Albert later. In 1978 Gunwaldt won the first Dwarven Invitational, and I was "Snow White" for a while (nothing official, just a fun thing but it was a great event). That's documented here and eventually I'll try to get photos up of some of that day. I was an honorary member of Hastle Castle (A Loch Salann situation), and that is referenced in a poem I never saw until lately: The Epic of the Defender of Hastle Castle, by Friar Orison of the Ribald Pen (Friar Orison Caird, who left the SCA not long after to become a famous novelist). There are ordered lists of achievements here: offices I've held, awards I've received in order of bestowal and in precedence order. I'd like to add a list of events I've autocrated, but that will have to be created from scratch because I never kept records. do have newsletters and notes, though. Here are links to lots of things I've written in and about the SCA. Below I'll tell stories and share some other things. I've made two tents. Designed them with one center pole and rope corners, fastened to a hanging top frame. The door is a double panel that overlaps. The black and gold tent on the right came to be known as "the vigil tent." It was made before the Outlands became a kingdom, and is still useable, but not as pretty. We used to try to recite the list of those whose vigils were held in that pavilion, but I think it's beyond anyone's memory now. Gunwaldt's squire Lavan Longwalker was first, though, at Estrella the same year the Outlands became a kingdom. Lavan was the last Outlander to be knighted by a King of Atenveldt; we were a kingdom a few months later. 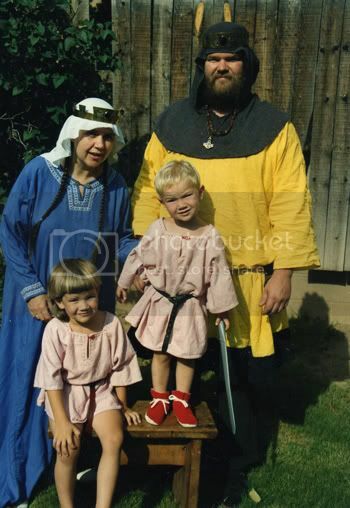 Gunwaldt and I eventually married and had three wonderful children, who in the SCA are Magnus, Bardolf and Asta. Baby photos of them are here. One of the most satisfying things I've done has been publications. I've been the chronicler of a shire, a barony, a principality, a kingdom and was Society chronicler, though not T.I. Editor. 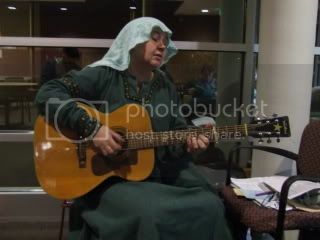 I did several publications of other sorts too�two ballad pamphlets, several Christmas music booklets for particular Midwinter feasts, a seneschals' handbook, and Bright Ideas, which was nice on paper but too expensive to keep in print. Some articles are still passed about. But the biggest and best thing I ever did was ThinkWell, a publication that went 20 issues and changed a hundred lives. Maybe more. Though it can't be repeated, it's having a second pass of sorts as ThinkWell TNG, a designation inspired by a group of squires and a newmade knight who talked to me last summer about there being a whole new generation that wanted to learn from me. Their knights and idols are my husband's former squires and other friends their age, many of whom I knew when they were teens and 20's. Perhaps we're on the umpty-next generation, but they do want to steep themselves in ideas about virtues and principles. While publications thrill me, probably some of the best use of my time has been in philosophy discussions. The first one is documented here, and the most recent one was three nights ago and it was pretty great too. The knight referred to in the first writing, though he's not named there, was Sir Lancelyttle du Pont. I saw him recently (2006) at the wedding of Jon Ibarra. Jon is also Master Balthazar, and was my protégé. But Lance (Lance Hale) didn't know Jon through the SCA, but through the Masonic lodge where the wedding was held. Of these three students, Helena became a Pelican. The other two signed on together and resigned together. I suffered a burnout period after the board upheavals in the early 90's. I had little kids, though, and it was easy to be busy and find fun elsewhere. As things go, though, several people at once wanted intensive SCA attention, and it was an interesting group, and so evolved "Duckford University," a compact, efficient, intense couple of years. After some particularly difficult incidents, I stayed home a while, and it turned to several years. Four or five years, I didn't play. I probably did as much as some other people did during that time, if sewing and cooking and counseling people by phone and e-mail counts, but I wasn't at events. Now there's a batch of philosophy students, and Artan has won Crown Tournament, not long before the 20th anniversary of his knighthood. It seemed a good time for me to come back out for a while. I've considered (seriously) changing my name to Ælflæd the Anchorite, and staying home forever. I might, but first I'm going to a few events. I want to see Anne Bigod made a Mistress of the Pelican. I want to see Artan's sixth coronation. I'm planning to sing at Midwinter. I'm in the thinking and inquiry stages of coordinating a series of presentations in al-Barran. DID THAT Guest Fest I guess I'm not quite ready to wall myself up, but I reserve the right to go back home after obligations are fulfilled. That anchoress business sounded better and better the more I thought about it. Here are some explanations, and some documentation (because if I'm going to do it need to do it like a Laurel and like a Pelican).